'Rapid Fire Questions' with Rob Johnston on Lost But Now Profound Podcast This a preview of an upcoming podcast with my friends Gabby and Trey. Follow @LostButNowProfound on Instagram for the full episode! Best of MTC: Dunnie West, Creative Consultant - Clients: Diddy, Will Smith, DJ Khaled and More! The Importance of Being Yourself, Dunnie West, Creative Consultant - Clients: Diddy, Will Smith, DJ Khaled and More! Meeting Sean 'Diddy' Combs - Dunnie West, Creative Consultant - Clients: Diddy, Will Smith, DJ Khaled and More! Dunnie West, Creative Consultant - Clients: Diddy, Will Smith, DJ Khaled and More! Meet the Creatives seeks to bridge the gap between entry-level creatives and top talent from companies like Google, Facebook, Nike, VaynerMedia, Airbnb, Twitter, Huge, Pentagram, Adobe and more. Meet the Creatives has over 200,000 downloads in over 65 countries. 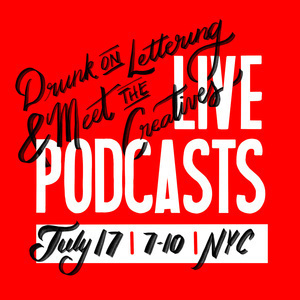 It has featured guests including Paula Scher, Debbie Millman, Malika Favre, Seth Godin, Michael Beirut, Jon Contino and more! On this episode, I meet Steve Giralt, Visual Engineer. We talk about what a Visual Engineer means, what it's like to work with iconic brands like The Hershey Company, patience and more! On this episode, I meet Becca Clason, Stop-Motion Animation/Tactile Lettering Artist. We talk about how she got started, her process, our mutual love of Chance the Rapper, Lettering West and more! Meet @MaryoBro who runs @StuckintheLibrary - Brooklyn College’s Magazine for Creatives! Mary is an ambitious, brilliant student who you will probably end up working for one day. She’s a BOSS! More about this podcast: The Empower Good Podcast is a weekly show designed to empower your personal influence for good. Each week, Joel Moutray, the host, will be interviewing guests who are mastering the art of influence and are taking their talents public so they can do more good! On this episode of Meet the Creatives, I meet Stefan Kunz, Lettering Artist & Content Creator. We talk about his love of lettering, latte art, grids, how to have happy freelance clients and more! Noemie Le Coz is an Australian, independent graphic designer, illustrator and art director, living and working in New York City. While very diverse, her aesthetic approach often merges minimalism with a distinct sense of play. Strategically, her work aims to elevate brand offerings by pinpointing audience appeal and distilling core messaging down to its clearest and freshest visual form. Previously at Pentagram Design, RoAndCo Studio, Hugo & Marie, Partners & Spade and Apple. Currently at Google Creative Lab. Rob Johnston at Brooklyn College (Highlights) - I recently had the great privilege of speaking on a panel at Brooklyn College with amazing creatives from companies like BuzzFeed, Droga5 and more. I edited together my long, crazy, rants as I talk about my journey, overcoming your ego, not being romantic about failure and much more! Simon is a freelance designer and custom-typographer working in Austin, Texas. Some of his clients, past and present, include Nickelodeon, American Eagle, Ed Helms, Vanity Fair, Pepsi, ESPN, Brené Brown, Nike and Target. Leta Sobierajski is an independent designer and art director based in New York City combining traditional graphic design elements with photography, art, and styling to create utterly unique visuals. Her work is incredibly diverse, ranging from conventional identities to brilliantly bizarre compositions. On this episode of Meet the Creatives, I meet the Steve Babcock, CCO at VaynerMedia in New York. We talk about his career, what it's like to work with Gary Vaynerchuk, how to get at VaynerMedia and more! On this episode of Meet the Creatives, I talk to my new friend SJ. We talk about how your career is like boxing, how his naiveté of film classics actually helped him become a better director, how to land a job in film and more! SJ is from Johannesburg South Africa, but now lives in Cape Town. After his studies he joined 7Films as a young director; moulding him into the director he is today. He is now a majority shareholder of 7films, an award-winning Production Company rated 2nd in South Africa. His work won silver and gold Loeries at the 2016 Loerie Awards; at the age of 22 he was the youngest winner. He won Gold at Cannes Lions in 2017 and silver at the 2017 Pendoring Awards. He is an ambitious, risk-taking individual, who is quick to learn and adapt. His style is inspired by real stories with real characters; he believes reality is stranger than fiction. Taking on filmmaking as a personal responsibility to the world at large. On this episode of Meet the Creatives, I meet the brilliant Josh Silverman, Design Producer at Twitter. We talk about founding Schwadesign, advice for entry-level creatives, what a day in the life of a Design Producer at Twitter is like and much more! On this episode of Meet the Creatives, I meet with writer, educator, artist, brand consultant and host of the radio show Design Matters, Debbie Millman. We talk about design, learning from failure, AIGA, the Masters in Branding program at SVA, how to be a generator and more! Young Guns 15 Winner Interviews - On this episode of Meet the Creatives, I interview a few of this years One Club for Creativity Young Guns winners. I tried to get through as many as I could but it got louder and crazier as the night when on. What can I say, The One Club throws a GREAT party. Congratulations to all of this year's winners! Andrew Fairclough, Illustrator, Designer, Art-Director - Kindred Studio is the multi-disciplinary moniker of Los Angeles based Illustrator, Designer and Art Director Andrew Fairclough. After a misspent youth completing a Business Degree, Andrew moved on to designing skate and snowboard graphics in between bouts of self-instruction and full-time work in a design agency. Andrew’s work is inspired by mid-century spot illustrations and design as well as vintage sci-fi, comics, surrealism, DIY art culture, and the textural wonders of degraded print. Often working with a restricted color palette Andrew’s work seeks to hint at the nostalgia and tactility of found art, whilst also creating something completely new. Petra Eriksson, Illustrator/Designer - Swedish illustrator, and artist based in Barcelona. Represented by Handsome Frank. Founding member of HER Barcelona, a part of HER Global Network. Joe Duffy - "Things You Love Doing with People You Love Being With"
Best Of - Joe Duffy - "Things You Love Doing with People You Love Being With"
Jon Contino - "There is No Off"
On this episode of Meet the Creatives, I meet Jonathan Correira, Design Director at Red Antler. Frances Smith, Designer at Facebook on Overcoming Imposter Syndrome and Applying to Your Dream Jobs. On this episode of Meet the Creatives, I meet Greg Hahn, Chief Creative Officer at BBDO, New York. 'Quiet Confidence/Being the Greatest' with Ahmed Klink - Ahmed and I talk about what it was like to shoot Kendrick Lamar, Future, Kevin Hart and discuss if it's okay to think of yourself as "the greatest". On this episode of Meet the Creatives, I meet Malika Favre. We talk about her unique style, color theory, copyright infringement, how to get recognized as an entry-level illustrator and much more! On this episode, I meet my favorite Designer/Illustrator of all time - Seymour Chwast. We talk about how he founded Push Pin Studios with Milton Glaser and Edward Sorel in 1954, what he loves to draw, his process, what he is working on now and much more! On this episode of Meet the Creatives, I meet Marina Esmeraldo. Illustrator & Art Director Marina Esmeraldo splits her time between Barcelona and London, creating colourful images for music, fashion, publications & brands. With her witty and vibrant illustrations attracting a range of commissions, her digitalized drawings are perfect for the internet age. Informed by her upbringing in northeast Brazil and previous training in architecture, Marina’s style is bursting with experimental shape, pattern and composition, adding a computerised dimension to her once tropical surroundings. She is also co-founder and art director of In Shades Magazine, a weekly illustrated short fiction magazine. Marina has exhibited around the world, including in the Venice Biennale, and been awarded honours in Europe, the U.K., the U.S. and Latin America. Her clients include Google, Adidas, Sony, ASOS, Refinery29, Lenny Letter, Wired, Women's March and many others. Checkin' in on Anchor! Reflecting back on 3 amazing episodes, talking about the future, how the creative field is really a mosaic...rambling. The most important thing is to follow Meet the Creatives on Anchor. On this episode of Meet the Creatives, I meet the wonderful Nicole Licht. We talk about her unique style, what it was like being a single Mom in New York City, her many jobs, climbing fences for art materials, her time at Etsy and much more! On this episode of Meet the Creatives, I meet Steve Campbell. We talk about his time at VaynerMedia, founding the Ascent, emerging technology, overcoming fear, documenting your journey and much more! On this episode of Meet the Creatives, I meet the one and only Paula Scher. We talk about her remarkable career, her journey through college/high school, how to get a job at Pentagram and more! On this episode of Meet the Creatives, I meet Sarah Tanat-Jones. We talk about how she landed a job at Handsome Frank, executing on your strengths, her love of music and much more! On this episode of Meet the Creatives, I meet Ahmed Klink. We talk about being born into a civil war in Lebanon, how he became a photographer, quiet confidence, making work you love and more! On this episode of Meet the Creatives I skype with Justin Gignac. We talk about his career, packaging garbage, Working Not Working and more! On this episode of Meet the Creatives, I meet Sean Adams from the ArtsCenter College of Design in Pasadena, California. We talk about design, life, Burning Settlers Cabin, Disney, setting books on fire in his driveway and how Slime Time Live needs to make a comeback. On this episode, I meet Adam Lehman, an insanely talented, 24-year-old Designer. We discussed what it was like to win AIGA's Command X, his lifelong battle with clinical anxiety, how a near-death experience changed his perspective on life and more! 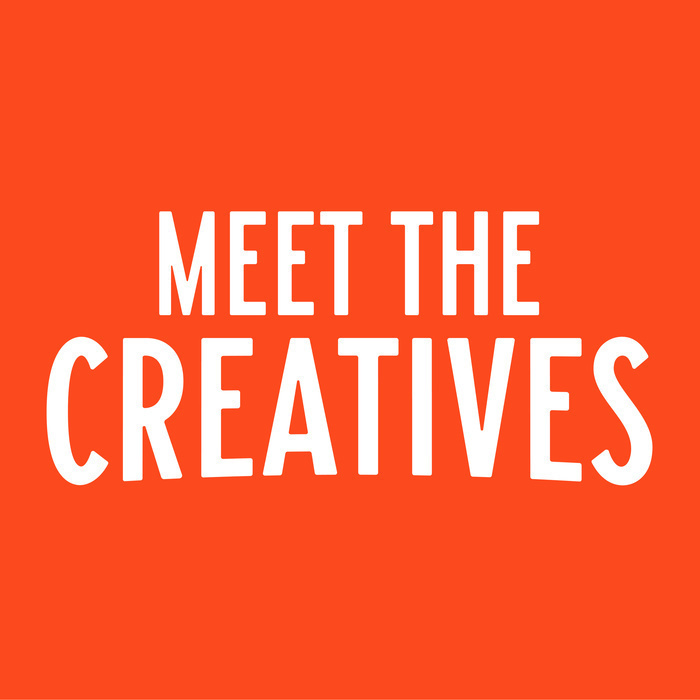 On this episode of Meet the Creatives, I meet the One Club for Creativity team. We talk about the history of Young Guns, this year's phenomenal judges, how to enter and much more! On this episode of Meet the Creatives, I meet Jon Contino. We talk about his love of baseball, our childhood creative endeavors, answer questions sent in by listeners and more! On this episode of Meet the Creatives, I meet Juan Carlos Pagan. We talk about his love of typography, the recent Sunday Afternoon art show, answer questions sent in by listeners and more! On this episode of Meet the Creatives, I meet Steven Heller. We talk about his incredible career, Design History, how to get a job as Designer and more! On this episode of Meet the Creatives, I Skype with Leland Maschmeyer. Leland is the executive creative director and founding partner of Collins. His work focuses on accelerating brand growth through story-driven design. On this episode of Meet the Creatives, I Skype with Jessica Helfand. We talk about her career, her and Michael Bierut joining Yale University School of Management as faculty and more! On the 26th episode of Meet the Creatives, I meet Alex Center, Design Director at Coca-Cola. We talk about Package Design, how meeting Leland Maschmeyer and Brian Collins helped him "slay dragons" at Vitaminwater, how Kanye West influences his work and much more! On this episode of Meet the Creatives, I meet the Rob Giampietro, Creative Lead at Google Design in New York. We talk about mentorship, the value of an education, how to get a job at Google and more! On this episode of Meet the Creatives, I Skype with Michael Bierut from his Pentagram office in New York. We talk about design, life and even discuss how the Wizard of Oz can be used as a metaphor to understand branding. Ron Burrage joins me for the 10th episode of Meet the Creatives! My apologies for the audio technical difficulties. My headphone microphone accidently got picked up instead of my actual microphone. On this episode of Meet the Creatives, I interview my good friend and fellow Designer, Zipeng Zhu in Madison Square Park. We spoke about Design, his time at Sagmeister & Walsh, interning with Paula Scher at Pentagram and more! On this episode of Meet the Creatives, I skype with Bonnie Siegler Founder of Eight and a Half. We talk about her career, making the perfect cover letter, how to get a job as a Designer and more! On this episode of Meet the Creatives, I skype with Ivan Cash. We talk about his career, connecting with strangers, and how getting arrested landed him his first job. On this episode of Meet the Creatives, I Skype with Joshua Lepley. Joshua Lepley is a freelance Designer + Art Director. Previously: Gretel, VSA Partners, IDEO, Saatchi & Saatchi — Clients include: Netflix, MetLife, Walmart, Lincoln, American Express. For more episodes of Meet the Creatives - www.JohnstonCreative.com On this episode of Meet the Creatives, I Skype with Lynda Decker. We talk about her new book Responsive Branding, urban resiliency and even discuss our horrible first jobs. On this episode of Meet the Creatives, I Skype with writer, educator, artist, brand consultant and host of the radio show Design Matters, Debbie Millman. We talk about design, learning from failure, AIGA, the Masters in Branding program at SVA, how to be a generator and more!